I just had the same problems you did. And I've also noticed that it is not a Free Version either. I just got a foot pedal to aid in my transcriptions and I can't load any other audio files - I just receive a popup directing me to the website to purchase the software. If I have to purchase software, it won't be from this company. I also tried to download an earlier free version, but it seems like it won't work on my Windows 7 computer - only on Vista/XP and below. I read your piece "On the perils of Express Scribe" namely NCH software suite and how it infiltrates ones computer with malware. I find myself victimized by this software as you were and unfortunately by searching on ways to uninstall the software, I am at a complete loss. I am running XP and the stated way of uninstalling the software is to go to control panel, select... add or Remove programs, and then select the NCH software program to uninstall. However this program is so insidious it is NOT even listed as a program in my control panel! When I explore all my files, it clearly is listed as a program File under the heading of NCH Software and NCH Swift Sound. Within these files however, are Uninstall.exe files. When I try to click on these files to uninstall each file individually the executable file does not work...so I am at a complete loss. I am using ESET which picked up these files as Malware threats and out of frustration I cleaned and deleted the files which eliminated the uninstall executable that didn't work in the first place, however when I run the scan the threats do not appear now. I do know that these items are still embedded within the programs on my computer and I suppose I could reinstate them using the ESET software. I was wondering if you had any suggestions for me? The programs files still appear on my C drive under the program file category and I would like to clean my computer from this malicious software. I would appreciate any suggestions you might be able to give me. I had to re-install the program recently and I haven't had as poor of an experience with version 5.63 (the newest as of at least a few months ago). This one appeared in the Add/Remove programs (at least in Windows 7) and seemed to more or less uninstall everything. There were some lingering traces in the registry, but that's the case with most programs. One thing that may be worth trying is downloading the newest version, installing it, and then trying to uninstall that one. This could solve a few potential problems (such as corrupted uninstall .exe files). If that doesn't work, there are third-party uninstallers you could try. I have no experience with any, so I can't make a particular recommendation. The alternative would be to delete the files by hand and go through the registry manually cleaning out the remnants. Tedious and tricky, but not impossible. Another thing to consider is that Windows XP will cease to be supported by Microsoft starting next month. Not upgrading to Windows 7 will open you up to security threats due to a lack of updates. Actually, 5.63 seems to install a TON of associations for nearly every file extension there is for "Express Burn" and they don't go away when you uninstall ES. I seem to have Express Burn installed, so I might uninstalled it, but I would like to get rid of the unzip association as well, not to mention the scads of shortcuts to their other software that I am extremely not interested in. It would be nice to have some sort of "fix" program to do all that for you after you install ES so that ES is the only thing you actually install or have on your computer. I, like the reader above, also have the problem with non-NCH foot pedals not working after 14 days - giving me an option to buy at a discounted price. I'm sorry, but I really do not want to pay for such a deceitful program, especially one that refuses to work with the most popular foot pedal out there (inifinity) and one that also refuses to work with DSS and DS2 files, though the paid "pro" version is supposed to handle them. In reality, the files are either silent or they cut off, meaning that the client gets a half-typed file and some companies will blame that on the transcriber meaning loss of pay or worse. Not nice NCH. As for other programs there is FTW, which used to cost about $2 a month, then they revved up the pricing but won't fix their software. One problem I have is that you either have ALL hotkeys enabled or none, so if you need to timestamp, then you can't get email, spell check, rename documents or use any of your F keys, and often times copy and paste do NOT work. Also, the timestamp forces hours on you, so at 1 minute 3 seconds, you'd have 00:01:03, which some clients do NOT like, meaning manual deletion of the hour thing every time or search and replace when you're done if you remember. There are other problems, like backup on stop, adjust ff and rew and other features ES has that FTW obviously either does not understand, does not think is useful or cannot implement. Yes, I've written to them and yes I was nice. You also have FTR (for the record I think it's called) and that is supposed to work well for court and is supposed to have very good audio. Same happened to me with another piece of NCH's sh*tware. I immediately went back to the last restore point. Kudos for putting together a clear explanation to warn others. Re. your request: "If you know of one, please leave a comment saying what it is and where to get it." Yes, a whole suite of audio/transcription/linguistic software and (as far as I know) it is all completely free and without restriction. The developers are called SIL. But their products don't appear on the usual freeware sites. So what's the catch? And how can you tell it's not more malware like NCH? Some explanation is called for. These guys are not motivated by money but they are on a mission. They don't want to take over your CPU but they do want to save your soul (or rather everybody's). SIL, the Summer School of Linguistics, provides money, training and resources (including some sophisticated-looking software available for download) free to anthropologists and linguists. The objective is to document all the world's languages to facilitate subsequent translation of the Christian Bible (presumably to subsequently bring on 'the rapture'). Full disclosure: I haven't tried the software myself. I am not (as I hope I've made clear) in any way associated with them. This one looks like what you might be looking for. Thanks, it's always good to get more tools in one place for people to try. For what it's worth, Transana (http://www.transana.org/) is another tool for transcribing that looks promising. It is open source (GPL licensed, in fact), but it isn't a free download. The source code is available so one could technically compile it from scratch, but it looks as if it has some rather specific dependencies. There is a free demo, but I haven't tried it yet. Thanks! This looks like a really useful service, and one that I'll probably try the next time I need to transcribe. My only concern with relying on websites is that they could choose to either no longer be free or stop working completely without any warning. (Also, there are privacy/security implications for uploading data to a server controlled by someone else.) Still, this looks like a useful tool for many people. I just went through two weeks of gruesome hell with NCH software/Express Scribe -- the PAID version!!! I had been using a paid version and got a pop-up that I needed to pay again. I thought the license was for one year only or something. I went and paid again for the newest version, downloaded it, and it came with third-party software wrapping that unleashed a rogue application from hell on my desktop that completely took over. I could not use my keyboard, mouse, could not do a hard shutdown, and could not reboot in safe mode. I have ESET, and it didn't stop it from downloading all the malicious malware/adware. I got most of it off eventually with their phone techs, but it damaged my computer. I think it hurt my motherboard because now only one of five USB ports work. I tried using a four-port adaptor in the one port, but it will only recognize one thing. It's a Vista 64-bit operating system. I didn't know it was from Express Scribe. I thought it came from something else, so I went and installed Express Scribe on my laptop, an XP 32-bit system, to do my job. It was unreal. I didn't even have a chance to opt out of any toolbars or adware. That thing instantly disabled my laptop with a Trojan32 and some other Win32 destructive malware/adware. It took three days and a system rescue & recovery to get working, but it kept happening. I'm still having problems because of it and don't have the level of computer skills to know how to go into the registry and manually detect and delete all the extensions. The company claims you can choose to opt out of additional things, but you can't. It disables you before you even know what happened. They also claim that what's imbedded in it will not disrupt your computer or disable it. That is completely false. I went through two weeks of computer hell because of their programs. You should read the horrific recent posts on CNET about this insidious wrapping. Ugh! I tried FTW. It is only $1 per month, but some leftover rogue applications from the other program were triggered by it, and I had to do a THIRD rescue & recovery on my laptop. It was brutal! I don't know of any safe ones, but FTW claims they are safe because you can download them from CNET. I don't know what to believe at this point. I have been through so much, and NCH lies their face off. They may not realize how destructive their adware is or can be, but how could they not? I'm sure a lot of people have complained to them about it. Thank you for this site and its suggestions/recommendations!!! Have you tried For The Record's free Player software? I have had the same issues with NCH Software's malware as detailed above. They're ruined my computer. No matter what I do, for example, it won't allow me to open PDF files anymore without popping up to try to force me to install their lousy programs. I have tried reassigning the PDF files to Adobe using multiple methods, but it doesn't work. NCH Software should be put out of business by the authorities for their malware. I purchased a transcriber from Martel and it came with this ES software. I have ESET and it did not want to install it. I somehow got it installed and then it wouldn't work. It is junk. I cannot believe Martel sold me the transcriber and then included this awful software. It included 82 other things on it that I had to manually delete. It was even hard to delete off the Control Panel. I paid good money for this system and all they sold me was malware. If Martel does not make this right, I will file a complaint with the BBB and the state attorney general's office. I cannot believe that I ended up with this junk. I just wanted a system to play back MP3s or wav files. I have never been so ripped off. Just another warning to those of you who decide to go for the paid version: NCH will only have the latest versions of the program available for download. At the same time, their licenses are only good for three months. So if you ever have to re-install the software, you'll be forced to pay again unless you kept the original installer. In addition, in the most recent free versions, foot pedal support is no longer included. Kudos to you for posting out about the "FREE but not really" software. If they are doing this to support a Christian cause, I am more chagrined at what I perceive as a lack of honesty (although I suppose they have a point of view). My free ES has worked fine, and has been free so far; but many others have had their systems or work products hijacked one way or another. Interestingly my associate was being "blackmailed" by the program into purchasing the paid version. However, when she installed the altoedge program Pedalware, which they boast is "really free", the ES program began to function again. Pedalware is JUST the pedal to program connection - no voice rec, no annotation, no coordination with word processing software. I haven't tried Pedalware myself so I can't vouch for it being "no-strings-attached" but would like to know if others have experience with that or with Pro Transcribe. I installed Express Scribe yesterday at the recommendation of a General Transcription ebook, which stated it would be a good way to get a feel for transcription before diving in, and it has effectively shut my laptop down. It refuses to connect to the internet, won't open documents, etc. To say I am pissed is an understatement. Once I get it all cleaned up (goodness, I hope I can) I plan on writing the eBook author and email, and will most definitely include this post within it. I wish I had thought to look into it before downloading. C'est la vie. The version of Express Scribe released in 2007 had several improvements in the audio quality during playback at slow or fast speeds. Look for it, it was about 378kB. Once they upped the size of the download to +900kB, they started including the Hijacking of file extensions etc. I may have a copy on my PC from then, but I'll have to look for it. Haven't found that old version online at the moment. Something more, if one converts the audio to a compatible format so that one does not rely on NCH component downloads, one can extract scribe.exe from the installer with a zip programme and run the executable without installing it. A few little glitches, yes. However, I have been using this program for nine years to hear the medical reports that I transcribe and find it to be excellent. I purchased another program but went back to the free ES. Express Scribe. One word description: CRAP! I paid for the system on the recommendation of the company I transcribe for. Lots of add ons that I didn't want and can't get rid of. Sound is horrible! Contacted them by email. They said try this, try that. HA! Nothing worked as I had already tried it. Then they had the audacity to suggest I email them the transcription I was working on. DOUBLE OVER IN LAUGHTER at the stupidity of that person. Like I am going to send them something that is not to be seen by another person!???!! I would love a system that has the ability to put in time stamps and to help with the audio portion when you get transcriptions that are horrible - muffled, etc. AS for Express Scribe?? RUN AS FAST AS POSSIBLE FROM THIS PRODUCT! Thanks so much for this post. Thanks to all those who shared their valuable comments and experiences. I just now downloaded Express Scribe but reading this blog in time, averted a tragedy in my computer. 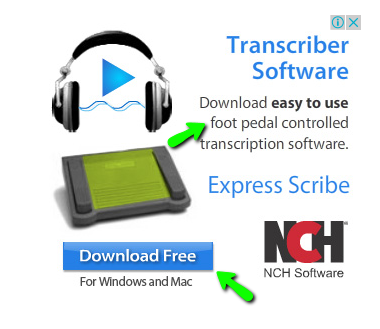 However, I read about an online transcription service from https://transcribe.wreally.com. It is a paid service. I find no mention of that in this post. Do any of you have any experience using that? If so, I would be eager to know your views? I found the express scribe very help. I followed the instructions and did not install the extra software they can add. It works great. The situation is even worse than I thought. Have a look at this screenshot of one of their ads I just saw on a webpage: http://i.imgur.com/cbs3UNA.png (The arrows are my highlights.) If that isn't deceptive advertising, I don't know what is! I'm going to report them to Google because that's an Adwords ad. I guess I could see how you could download free but maybe the foot pedal support costs money? Still, certainly not totally transparent advertising. Hi. I have been using free transcription programs for some years. Originally I had ExpressScribe from years ago, which wasn't so annoying (just a few nag screens every now and then). The program I would suggest as an alternative is called F4 and it's from a german company at https://www.audiotranskription.de/english/f4.htm#prices. They used to have a free version. They still do (the 'demo' version) but the webpage says it has a 10-minute time limit on it (as in it will only play the first 10 minutes of an audio file), so if your file is less than 10 minutes or you can cut your file into 10 minute slabs, you should be fine. I found the program great. Just as useful for what I needed to do as ExpressScribe (easier in some ways, and it will do video as well as audio, or my free version does). One thing though, it initially opens the transcribing window with all the menus in German, but if you click on the bottom right-hand side where it says EN (I think or it may be EG?) it changes from German to English. Great little program. I recommend it as an alternative to ExpressScribe (though as I said, I've got an old version).